It's Thursday! Time to share what we've been reading this week. 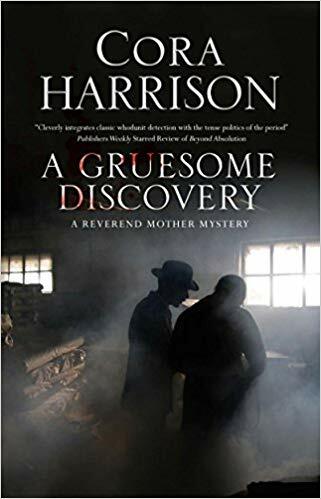 I'm just starting the fourth Reverend Mother mystery by Cora Harrison, A Gruesome Discovery. This is a fascinating historical series set in Cork, Ireland in the 1920s. Reverend Mother Aquinas is a prominent figure in the city. She came from a well-off family, and knows many of the people of Cork, from the wealthy to the poorest people whose children often attend the convent school. She taught a young woman who is one of the rebellious Republicans, and she taught an inspector with the Civil Guards. Unfortunately for me, I read the fifth book first, so I'll be finished with the series until a new one comes out. What are you reading this week? Any books you'd like to share with the rest of us? I'm almost halfway through Michael Connelly's DARK SACRED NIGHT, his first collaboration between Harry Bosch and recently introduced Det. Renee Ballard. I need to finish it before we leave for New Orleans on Saturday, but it is a fast read (as always with Connelly) so that won't be a problem. Each is working their own jobs, but the two are trying to solve a cold case murder of a teenage prostitute together. I am finding the Bosch section about a gang killing far less interesting than the rest. I read John Scalzi's THE CONSUMING FIRE, his sequel to THE COLLAPSING EMPIRE in his newest SF series. Once he gets on with it, it is quite entertaining, but those offended by use of the "F" word might want to steer clear, as my favorite character curses a lot. Several other things are in the middle, including the Brendan DuBois story collection mentioned previously, which I should finish shortly. I've also started THE FUTURE IS FEMALE! 25 Classic Science Fiction Stories by Women. This is a Library of Congress Special Publication, edited by Lisa Yaszek, with stories originally published between 1928 and 1969. I know I seem to be reading more science fiction these days. Books - I can never get enough of them! I just started listening to Pretty Girls by Karin Slaughter and I'm about to start an ARC of The Suspect by Fiona Barton. I finished Shelley Noble's ASK ME NO QUESTIONS last night. I liked the Lady Dunbridge character and her maid and butler sidekicks. I got a little restless at the horse racing storyline and wished the story had been about something else. I probably would only pick up the next one if I was interested in the plot line of the murder. Now I am reading HOUSE OF GOLD by Natasha Solomons. My book club loves mystery novels and A Gruesome Discovery looks great! We're getting in to Spirit of the Fox by Matthew O'Connell - a little bit of mystery and Japanese folklore balled up into what's proving to be a page turner. His site www.matthewoconnellauthor.com has more info. Thanks for this fantastic review, we're constantly looking for new adds to our reading list. Currently reading Anne Holt's "Odd Numbers" - I like her characters and they all take place in Norway. I recently discovered her and her books are quite good. I love this weekly event, Lesa! Have I said? Our mystery book group discussed IQ by Joe Ide last night. Interesting discussion. Funny thing was that the 3 men who read it didn't care for it much and most of the women were very impressed. It's pretty urban with setting and language, but definitely has the Sherlock influence. Right now, I'm listening to Elinor Oliphant is Completely Fine for another book group. I am loving this book. It's sad and poignant and funny. So glad a former library colleague suggested it. I'm reading another Kristan Higgins book, On Second Thought. I read another book by her recently and in an attempt to 'change-it-up' a bit in my reading, I'm having a great time. Next year, my plan is to read some older books and series - not quite so many of the new books. I'm getting really excited about that and have ordered two books from ILL. I do have the first book in the Reverend Mother series and hope to read it before long. I've enjoyed your thoughts about these books. Jeff, I've read a couple John Scalzi. I follow him on Twitter, and he's wonderful there. Of course, I agree with him politically, which helps. Anyone who loves cats should be following his account for his cats on Twitter (no politics. It's called Scamperbeasts, and it's hilarious. I love his sense of humor. Have a great trip! Another friend is heading to New Orleans. Must be the place to be right now. Lori, I really do envy people who can listen to audio books. I don't have a long commute & when I'm home I'd rather read a physical book. But, I like the thought! I get that, Sharon. It's rough if you like the characters, but not the storyline. Someday, Donna, I need to try Anne Holt. Another one of those "someday" authors. Kay, That's really interesting that the women liked IQ and the men didn't. Very interesting. I love this series, and I think there's some meat in these books. It's interesting how the setting, the Church and the politics go hand-in-hand. I'm so glad you enjoy What Are You Reading? You really have Jeff Meyerson to thank for it being a weekly feature. This week I read UNDER THE NOCTURNE MOON by Larissa Emerald which contains two paranormal romances set in Kristen Painter’s Nocturne Falls universe. THE THIN PLACE by Lori Herter which is a short romance set in Ireland. And a cozy mystery, PREMEDITATED PEPPERMINT by Amanda Flower. I started THE TRAIN TO IMPOSSIBLE PLACES by PG Bell which is a children’s book about a human girl who winds up on a troll train but I wasn’t interested enough to finish it. Thanks, Lesa. I love to read about what other people are reading, even if it isn't something that appeals to me. There will always be something of interest. I read Scalzi's blog every day too. I read DESERT REMAINS by Steven Cooper after seeing Lesa's excellent review of the second book in the series (which was released October 30). Phoenix detective Alex Mills struggles to solve a string of gruesome murders featuring young women left in desert caves on whose walls their deaths are illustrated by crude petroglyphs. So he calls on Gus Parker, whose psychic skills have been used by the Phoenix police. Gus, who works by day as an imaging technician, has visions that sometimes describe what has already taken place or what is to come, or can be merely symbolic. In the midst of this critical situation, Alex and his wife must deal with the arrest of their teenage son for drug dealing, and Alex has to contend with an over-eager former FBI agent who threatens to take over his case. Both of these characters are fascinating, unpredictable, and human, and the case is compelling. Even though I figured out the ultimate twist, it didn't ruin my enjoyment of this promising debut. I have already put the second in this series on hold. I liked THE PINT OF NO RETURN, second in Ellie Alexander's fast-reading cozy series, even better than the first. Oktoberfest has taken over the German-theme town of Leavenworth, WA, and a documentary team is onsite to film the beer-related festivities. Sloan is enjoying lending her talents to a small craft brewery and is attracted to her boss, while her soon-to-be-ex is showing signs of wanting to get back together. The obnoxious has-been actor fronting the documentary is found dead, and not one of his fellow crew members shed a tear. Some of the less likable characters are over the top, but it was a satisfying read. Charlotte, I'm happy to see you continuing the Monkeewrench & CatintheStacks mysteries. It must be peppermint season, Sandy. I'm carrying In Peppermint Peril by Joy Avon with me today. You're so right, Jeff. Thank you for keeping this going. Margie, I have to read The Pint of No Return. I have it someplace in the house. I enjoyed the first one, but trust you when you say the second is even better. Happy you liked Steven Cooper's characters! I am half way through Killalot by Cindy Brown and enjoying it. I stayed awake way past my bedtime last night to finish Sara Paretsky's SHELL GAME. I highly recommend it. I've read all of her V.I. Warshawski books but this is Paretsky at her best. Did you know that she's one of only 4 living writers who have received both the Grand Master Award from the Mystery Writers of America and the Cartier Diamon Dagger from the Crime Writers Assoc. of Great Britain? The others are Joh le Carre, Lawrence Block & Peter Lovesey (whose latest, BEAU DEATH, I read recently). I found that info on the dust jacket. Just finished Crisis by Felix Francis. He has followed in his father's footsteps and continues to write very entertaining books related to horses and horse racing. this book features a lawyer that works for a Crisis Management company. The crisis is a prize winning horse has been burned to death in his stall. Currently reading Date with Malice by Julia Chapman - the second in a series and next up will be the newest Connelly. And I see that the holiday David Rosenfelt is in transit to me so that will quickly rise to the top. I too enjoy reading what everyone else is reading. Too many books and not enough time. About halfway through Always Look on the Bright Side of Life: a Sortabiography by Eric Idle, switching to Donna Anderson's latest Meg Lanslow, Lark the Herald Angels Sing. Both are most enjoyable and great for tension relief. Also a devoted follower of Scalzi's Whatever blog. Solo by William Boyd; James Bond, just turned 45, goes to a dirty African war in 1968. This isn't Ian Fleming's James Bond, that's for sure. Last Snow by Eric Van Lustbader; Dyslexic agent investigates why a US Senator died in Capri when he was supposed to be in Bern. Putin! that's why. A Small Dose of Murder by Aldon Gransky; A medical mystery that is is all wrapped up in 3 pages at the end, after a lot of foreshadowing that came to nothing. White Fire by Preston & Child; A serial arsonist/killer in a ski resort community. Pendergast investigates, and finds a Sherlock HOlmes pastiche, but most of the action depends on a supporting character doing stupid things. In Danger's Path by WEB Griffin; USMC WWII Soaper. Mark, You can tell just when I get busy, can't you? I sort of drop out. Thanks for sharing Killalot. Sally, I didn't realize that about Sara Paretsky. But, if anyone deserves those awards, she, along with the other three authors you mentioned, deserve it. I hope you're enjoying Death with Malice, Netteanne. I'm enjoying that series. You are so right about too many books, not enough time! Good to know Eric Idle's book is good, Cyranetta. I have that in a pile in one of the bedrooms. Love John Scalzi's wit. Glen, Your brief commentaries slay me. I always laugh when I read them. This series sounds interesting Lesa, I'm going to look it up. Currently I am reading The Perfect Mother by Aimee Miller and Fear by Bob Woodward. O.K. You all talked me into it and I put Steven Cooper's first book on my library list. The 2nd is also there if I like the first as much as you did. I just started Field of Bones by J.A. Jance It's a Joanna Brady mystery set in Cochise County Arizona. I just finished The Gate Keeper by Charles Todd. I started reading the physical book but it was due back at the library before I was done.I finished it by listening to the audio book. I am reading two "can;t put them down books" at the same time. I am more than half way through Come November by Katrin Vab Dan, Rooney Harris, a high school with her mother and her much younger brother, Daniel. Her mother is divorced and just her low paying job at day care center. She spends all her time on the computer on the website of the Next World Society and attending the local meetings of it. The weight of all the family responsibilities fall on Rooney. Does all the cooking, cleaning and caring for Daniel. Takes on an extra shift at the local grocery. Her mother keeps talking about the Departure in November. Then, things suddenly get much worse!!! That is where I am in thi book right now. Also reading Proud by Ibtihaj Muhmmad It is an autobiography of the first Muslim American to win a medal at the 2016 Olymphics. My eyesight is getting worse, the glaucoma is advancing and I am trying out an very new eyedrop medicine to see if it can stalll blindness. Reading my print books plus the ones that I can, Only buying audio books now.